After chapter 3 you know now every pattern and the important rules. If you’ve already tried to count a certain stock or index outside of my tutorial you probably felt pretty helpless. You probably didn’t know where to start or if you finally found a count, you were happy with, you didn’t know what to expect next (A second wave? A B wave? A zigzag? A triangle?). For that reason you’ll learn some guidelines in this chapter which should help you to count the waves correctly. In an impulse the two corrective subwaves 2 and 4 usually alternate. That means, if wave 2 is a sharp correction then wave 4 is a sideways correction (and vice versa). 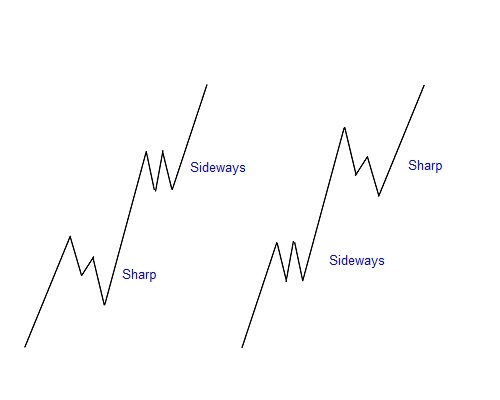 Zigzags fall into the category of sharp corrections, any other corrective wave is considered to be a sideways correction. If you hear Fibonacci for the first time you should check out Wikpedia first. Fibonacci retracements are usually referred to as the 23, 38, 50, 62, and 76 % retracement of the previous wave. Very often corrections will be completed at one of these retracement areas. In an impulse one of the actionary waves is usually longer than the others. 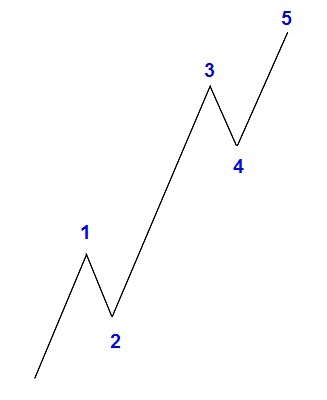 Very often wave 3 is the extended wave. The non-extended waves are usually of equal length. Congratulations! You're now ready to EW! Despite the exercises I provided in this tutorial it's probably still very difficult to label a naked chart. But don't give up. As you practice you'll improve. If you're not sure about your count just send me an email and I'll be happy to help you. If you'd like to learn more about Elliott waves you might be interested in the following book: Elliott Wave Principle.